Police in Puyallup say they have arrested a 19-year-old woman on charges of vehicular assault and impaired driving after she crashed into a bicyclist and left him with devastating injuries. According to news reports, a 66-year-old man was riding his bicycle on Ninth Avenue SW just after 3 p.m. Monday when the woman, who was driving a Dodge coupe, ran her vehicle up onto the sidewalk and struck him. 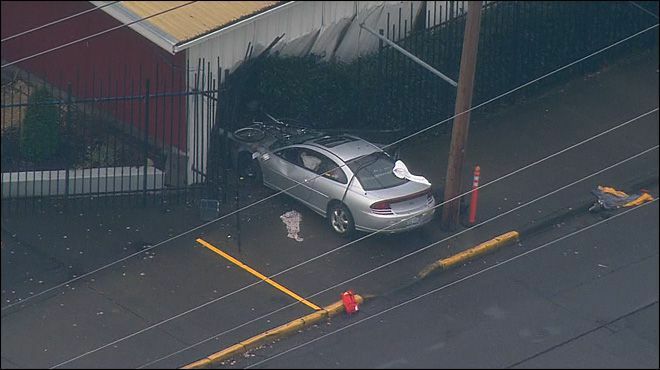 As you can see in the image above, the vehicle then slammed into the side of the wall of a Washington State Fair building. Officials said that the unidentified 66-year-old bicyclist was rushed to a hospital in Tacoma with serious and possibly life-threatening injuries. Upon interviewing the 19-year-old female driver, Puyallup police determined that she never applied the brakes before the crash occurred and that she also exhibited obvious signs of impairment. “She has been taken into custody for vehicular assault,” Puyallup Police Captain Scott Engle told a KIRO 7 reporter. One neighbor says that she saw the driver and passengers coming down the road from a house known in the area to be involved in chronic drug-related activity. Police were still gathering information and would not confirm these claims, but did say that the bicyclist is battling for his life. As is clearly the case in this incident, bicycle accidents are often extremely devastating for victims because bicyclists are extremely vulnerable to serious injury if they are struck by a vehicle. Many bicyclists are unaware that a motor vehicle insurance policy can often contain coverage that may be used to cover medical treatment and other medical costs. However, the apparent severity of this man’s injuries suggests that he will require extensive treatment and likely have to undergo surgical procedures. We will continue to update this story with more information as it becomes available. Our thoughts and wishes go out to the victim and his loved ones.